Hi, I am interested in your 1967 Chevrolet Nova (stock #1486-TPA) listed on Autotrader for $21,995. I'd like to get more information about this vehicle and confirm its availability. 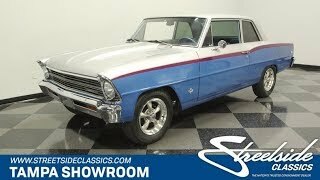 Cool paint, a powerful V8, and a terrific price this 1967 Chevrolet Chevy II seems to hit all the right marks, and its available right now. The first thing that strikes you about this car is the paint. You can immediately tell there was plenty invested in this custom application, but dont forget to check out the details. The blue and silver is nicely separated by the full-length purple. You can tell this is a thoughtful application by the shadowing around this line and how it tapers at the front for a sporty look. And speaking of sporty, the paint also does a terrific job of highlighting the kick-up at the rear fender. And its all cleared over together, so the light rolls off the straight body panels evenly. Nice chrome bumpers and the full-width grille add some flair. And the 15-inch REV wheels and cowl hood reinforce the sporty attitude. Inside there have been more nice investments. The exterior silver returns on the door tops and the rest of the metal is painted medium blue, so it feels like the two-tone is continued on the interior. Bucket seats, a center console, and Chevys iconic horseshoe shifter create a big power look in this lightweight Chevy II. Plus, with the custom auxiliary gauge trio high on the dash and a large tach added to the console, you know this one was built for performance. The 327 cubic-inch V8 looks great with the bold Chevy orange block radiating from the tidy black engine bay. But more than just look good, this small block has the right go-fast goodies. It includes a Holley four-barrel carburetor, Edelbrock intake, and headers that add power while also contributing to the rumble of the dual exhaust. Plus, with a stout three-speed automatic transmission, traction bars, and the modern grip of Hankook tires, utilizing this power is quite easy. This is the cool classic with the right look and plenty of power. So at a price like this, you know you need to hurry to grab this deal. Call today!! !